The Concept of Probability: The Problem of Foundations. Truth, Possibility, and Probability. Probability Models. Principles of Inference and Decision. A Medical Example. Elements of Probability Theory: Probability Theory. Disjunctive Spaces. Elements of Infinitesimal Analysis. Integration. Probability Distributions. Hyperfinite Random Processes. Probability Models: Simple Probability Structures. The Structure of Chance. Equiprobability Structures. Probability Structures. Examples of Probability Structures. Logical Probability. Statistical Inference and Decision Theory: Classical Statistical Inference. Problems in Statistical Inference. Decision Theory. Appendix A: Foundations of Nonstandard Analysis. Appendix B: Extensions of Integrals and Measures. Bibliography. Anyone involved in the philosophy of science is naturally drawn into the study of the foundations of probability. Different interpretations of probability, based on competing philosophical ideas, lead to different statistical techniques, and frequently to mutually contradictory consequences. 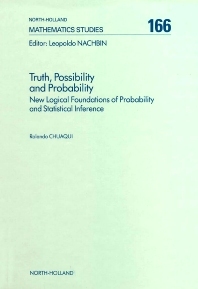 This unique book presents a new interpretation of probability, rooted in the traditional interpretation that was current in the 17th and 18th centuries. Mathematical models are constructed based on this interpretation, and statistical inference and decision theory are applied, including some examples in artificial intelligence, solving the main foundational problems. Nonstandard analysis is extensively developed for the construction of the models and in some of the proofs. Many nonstandard theorems are proved, some of them new, in particular, a representation theorem that asserts that any stochastic process can be approximated by a process defined over a space with equiprobable outcomes.